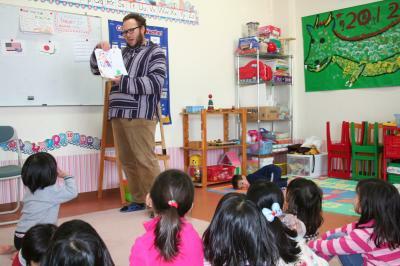 This month we are reading the book “From Head to Toe” by Eric Carle. This book shows us animals doing various things, and asks us if we can do them too. “I am a penguin and I can turn my head. Can you do it?” “I can do it!”　Can YOU do it? 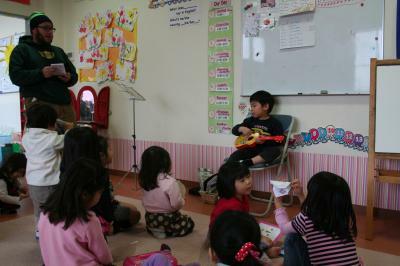 Today we practiced singing the Rupenzel songs our teacher wrote for our performance. We’re getting good! 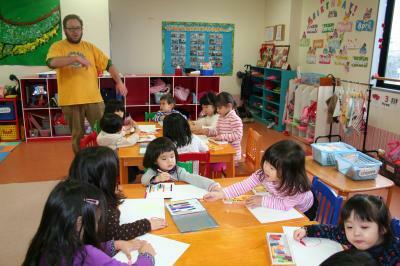 Today at art time we prepared for this year’s Setsubun on Friday, February 3rd. We made demon masks using paper plates, yarn and construction paper.Demons out, good luck in! 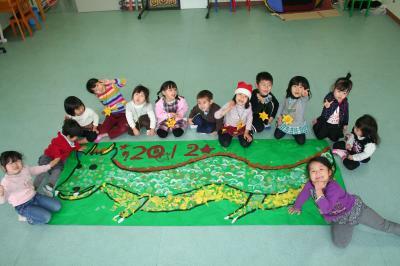 This week we celebrated the Chinese New Year by drawing pictures of this year’s animal. This year is expecially important, it’s the Year of the Dragon! Let’s hope the dragon brings peace, comfort, and happiness to all of us living here on this troubled planet. Happy Year of the Dragon! Today we practiced our English by asking “can” questions and role play. Role play is a great way for us to use our English, and “can” questions help us remember verbs. Today we had a party for our January birthday girl. We sang songs and looked at pictures of her taken and earlier ages. We also made a yummy birthday snack, anko pancakes! Today we practiced phonics by drawing pictures of vegetables, saying their names, then writing their names next to their pictures. This helps us to remember sounds and spelling by forming an image of the word in our minds.Practicing phonics using drawing and writing is fun! We will be takig the Jr. Step test next month, and we began practicing today! The Jr. 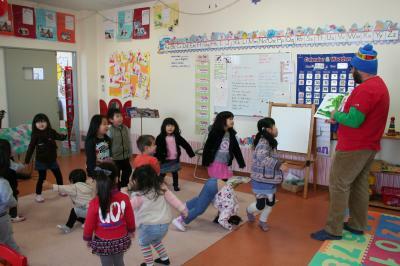 Step Test helps us evaluate our English ability, and allows us to set English goals. 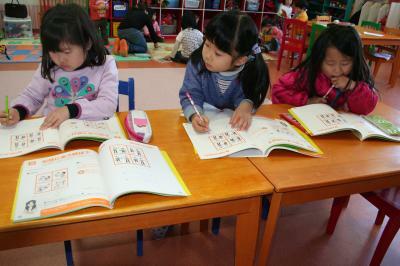 We all enjoy studying for the test, and practicing on our own. 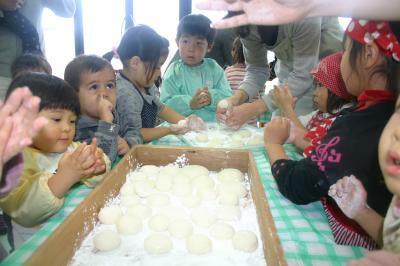 On Sunday we had a rice cake making party. 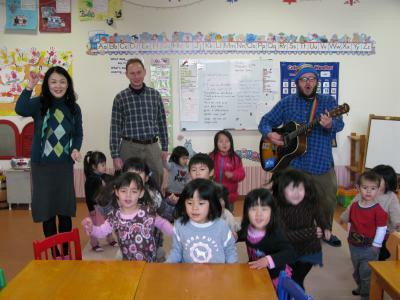 We sang songs and talked about the differences between Japan and the US. 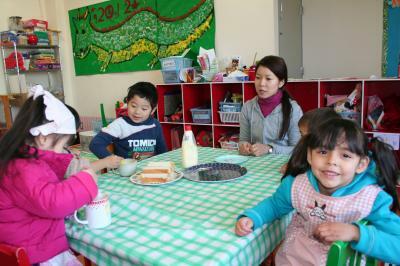 Then we made yummy rice cakes! We love sweet beans and natto! Today for show and tell we brought our Christmas presents. 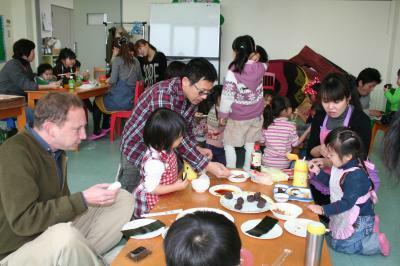 Defferences Between Japan and the U.S.
Today we discussed the differences between cultures in the U.S. and Japan. Today our teacher read us the story, Rapunzel. 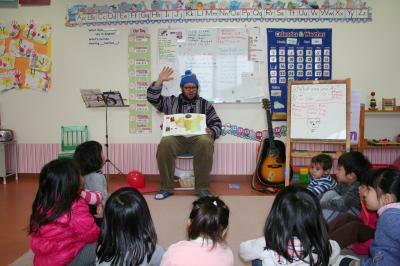 Our teacher also wrote two songs that go with the story. ♪Let down your golden hair. ♪We’re hungry, hungry, hungry, hungry. and steal some lettuce there…. Today we began our third term. As part of our new year, we decided our new year’s resolutions. We want to run, dance, and play everyday. 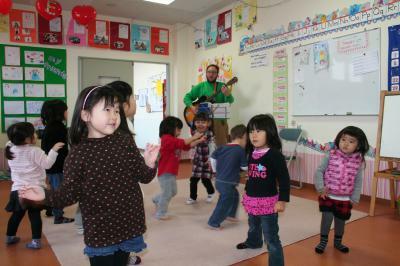 We think the world would be a much happier place if everyone would run, dance, and play everyday.You should try it! 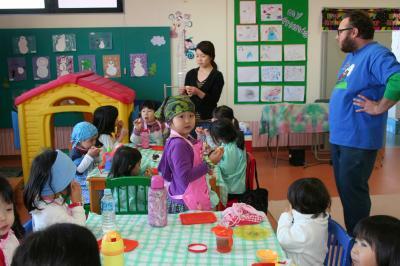 Today is our last day of winter school, and it’s Friday cooking day! Today we made yummy egg sandwiches!! You should try it!!! Happy New Year. Our 2012 winter school started today! We are planning a nice year at Apple Bee International School. We are going to work hard this year developing our young minds and bodies, and grow up more! Thank you for your interest in our school!